The fruit garden hasn't been in total vain though, I've learnt a lot from failing to manage this area. The first year it was in I stupidly left the soil bare, even though I had wood chip, for fear of the wood chip stealing the nitrogen from the soil. I know now that this would only happen if I dug the chips in! Time to crack out the digger. 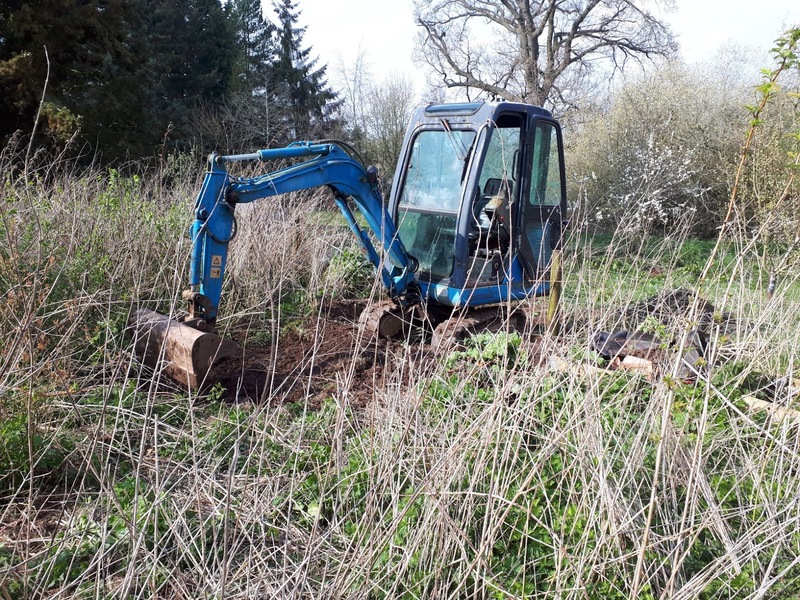 Over the last few years I've got pretty good at being able to use a digger and now it tends to do what I want it to without too much collateral damage. I got in there and started clearing an area. I used the bucket to dig out some of the fruit bushes and the rhubarb plants to go back in later (I'll show you my plan for this in another post). I was surprised that even with the digger it took some doing. The nettle roots go far and wide, but slowly I started to get the area nice and clear and level. Now the area is really to have beds made on it, manure spread and some careful growing this year. 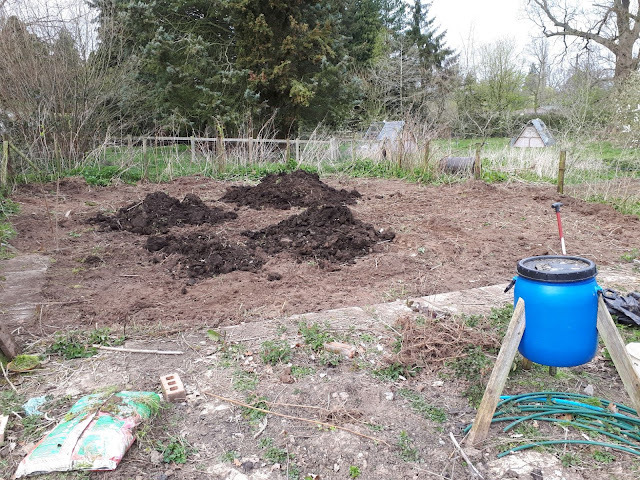 A few beds will be growing green manure to help build the soil back up (although I haven't taken much off) and other beds will be used to grow things like strawberries that can be grown through plastic to prevent the weeds coming back up and getting established again. 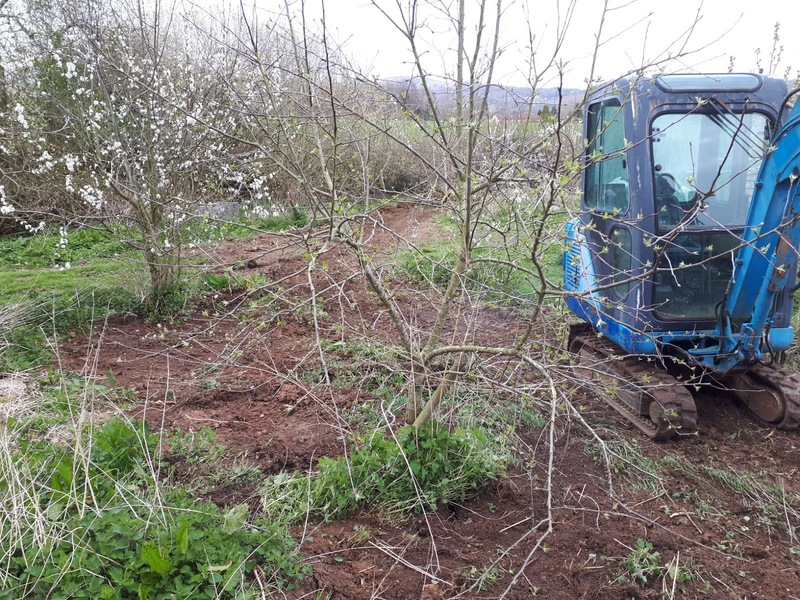 I then looked at the area under the this bit of garden and have decided that it will be perfect for the polytunnel I have been given to go up. Marking out the space it became quickly apparent that I was going to have to loose a few fruit trees. With my wife's help in the decision making we decided to loose two rubbish trees rather than two good ones and move the tunnel over 4ft. The two rubbish trees in question are a Czar plumb that has never fruited (although it probably would have this year. And a Discovery apple tree I planted when I first moved here but certainly doesn't have discovery fruit on it! So no great lose except for the huge amounts of roots and the fact I could have grafted them over to something else. The digger pulled them out easily and I soon had a nice area clear for a 10m by 4m polytunnel. Really can't wait to have the tunnel at the bottom of the garden like this. Hopefully I'm going to fill it with tomatoes, so many that even the kids won't eat them all and I'll have enough to preserve some! Putting this fruit area over to veg beds is going to give me at least another 12 beds, on top of the 32 in the main garden and if I decide to use the second garden then there will be another 20 in there, although that one might get sheeted over this year until this lot is under control. Lots of growing space and lots of excitement for the growing season! Who else has a polytunnel? Any tips for putting one up? Like you know I have a polytunnel. It was the best 500 Euros I have ever spent. I have seen polytunnels placed on concrete bases with the plastic wrapped round a 3x2 wooden frame. Ours was placed on soil and the plastic is anchored in trenches. We have a green mesh door and green mesh on the other gable. So we never shut the door and its survived the worst gales in living memory. How many hoops is your tunnel Kev? This one has six hoops. I'm planning on doing the same to mine. Dig in the posts then bury the plastic on the sides. How deep did you bury yours? I was wondering about the doors, last thing I want is it to be too hot. Maybe mesh would be the way to go on the doors. Four of us dug the trenches about two foot deep and pulled the plastic at the same time. Suppose you could dig the trenches with your digger. They get very hot. Forty degrees even. I had to put my cuttings outside under an hedge. Are you going to put some kind of irrigation watering system in? Some days I have to water twice. 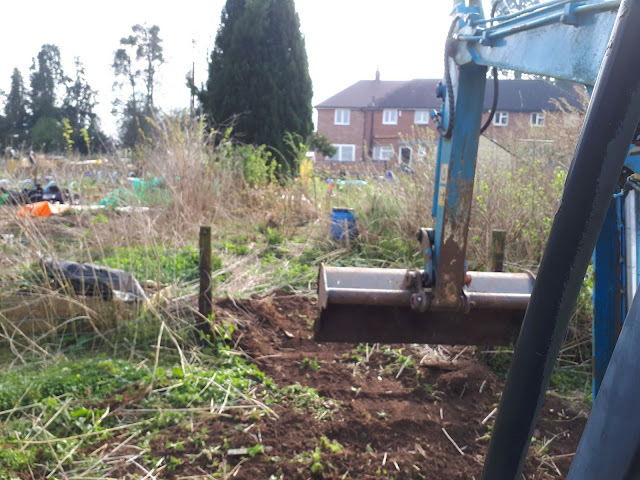 Yes, I'll use the digger to make the trench, no way am I digging that if I can help it! I plan to put a watering system in but not sure what one yet, probably homemade! I'd like one on a timer really. Ah I have to do things on a big scale, it's how I was brought up. Having the equipment helps, no way would I have done this area without the digger, it would take months! Each time I scooped up a load of soil I'd think "that's two hours work..."
I'm so excited about this polytunnel! I really can't wait, going to be such a great area to grow in. I think I'll fence it off as well. We're on the same wave length! Here is a link to my blog where I just discussed building my polytunnel. Mine is built for a very severe wind area, so it is unusual. When you're done, you'll love it! I'm trying strawberries inside mine this year. Ah, yours is a work of art! I've just shared your link on our face book group link! Really great walk through of how you did it, that is built to last! Mine will just be hoops and won't have that kind of strength! Strawberries are going in the area I've cleared above the greenhouse hopefully. Although I'd love to do a bed of them with my low hoops maybe. Wow, what an improvement to the area. 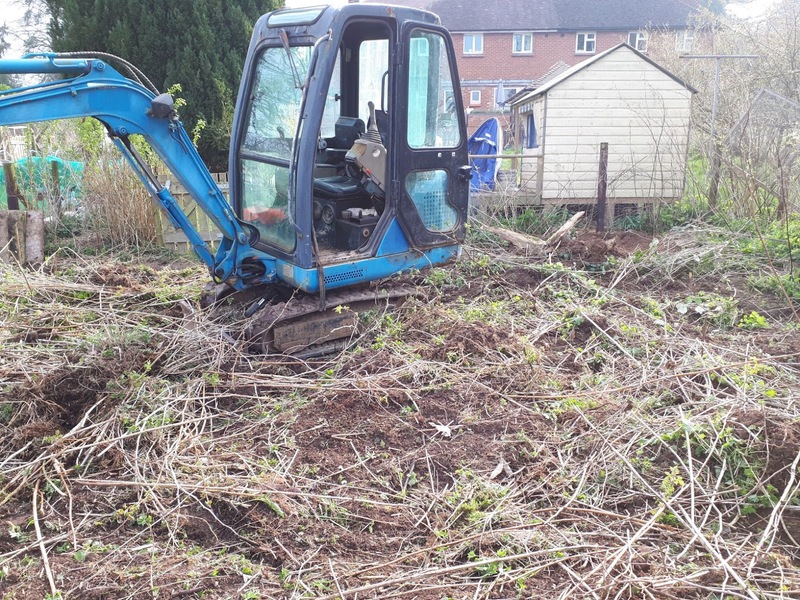 Yes, the digger certainly came in handy for that project. To say the least! 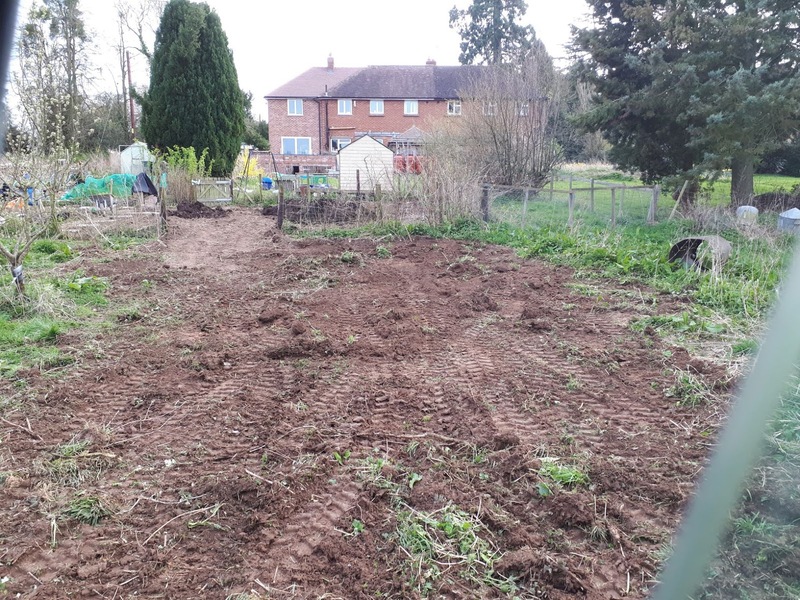 Isn't it exciting to be creating a new growing area? Up here near the tundra (! ), we so need some kind of a polytunnel or grow house or greenhouse or whatever. But like Mr. Inman's comment above, we're in an extremely windy area and have had visions of anything we put up landing in the next county. So I'm eagerly off to check out his set-up now. You won't be disappointed if you look at his! It's a masterpiece of polytunnel art! You always manage to grow so much already, sounds like I'll be even more impressed when you get under cover space set up! Well, what to say? First, Mr. Inman was my Dad. I'm just plain old 'Tim.' As for the polytunnel, it has so far withstood 80mph gusts and 50mph sustained winds. Heavy wet sticky snow was a match for it, but I have reinforcement ideas on the ready for that next winter. Built it tough for midwest prairie abuse! It's funny how nettles love raspberries. I have a similar polyculture in my fruit garden, although I'll try to modify rather than go to your extremes. With regard to polytunnels I love (love love) mine. 14 ft by about 40 on a slope so the beds inside are slightly terraced. It was here when we moved in. I think the hoops are slightly heavier duty than standard. I had to replace the polythene a couple years back, but think the original lasted about ten years (most years 90mph wind, but not much snow). If you can, I would recommend sliding doors, they are more practical. In a less windy area you can get nice designs with base rails, but if exposed then trenching the plastic is best. The advantage of base rails is you can have waist rails as well and have increased ventilation, which may be useful. In Solihull I had a smaller tunnel and managed to rig up automatic openers on the doors (greenhouse struts) which meant I didn't need to pop over to the allotment every morning and evening. Unfortunately a family of foxes ate the plastic only a week after I put it up! You may want to consider a second mesh door against vermin (my cats love mine, and use it as a climbing frame. We're not on mains and I don't like spray system irrigation anyhow (I think the water on the foliage is a bad idea) I have set up a trickle irrigation system using old leaky hose pipes with extra holes and I move the hose from bed to bed and leave it going when I'm working in there. Lovely indoor gardening! I did go a bit to extremes with clearing the area, what I took off won't be wasted though, I'll sheet it and compost it, stir it wait the digger from time to time and reuse it in the garden. The polytunnel is really exciting, I can't wait to have this area! 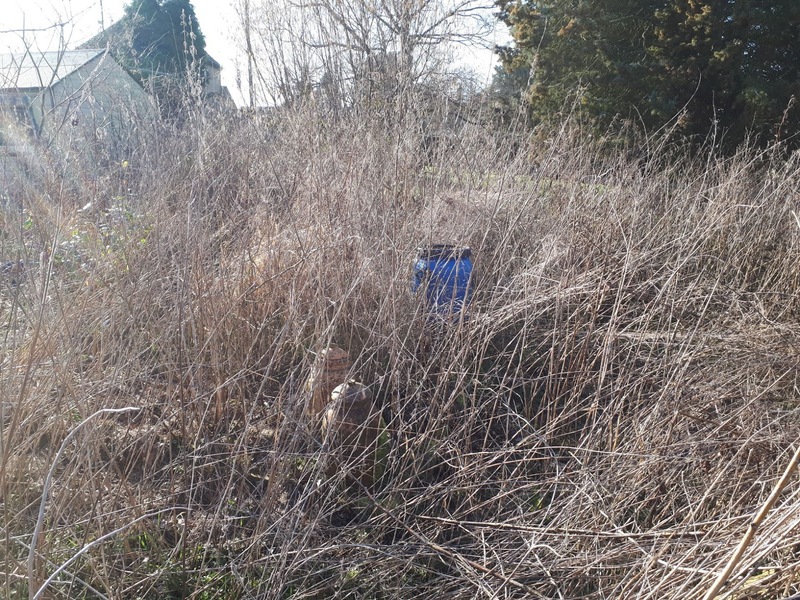 I think I'm going to fence round it with rabbit wire, give me q small growing area around the outside and hopefully stop any rabbits getting in, no cats around here thankfully. Slidding door is a good idea and one I hadn't considered. The water system also makes me ponder, I want to use and store more rain water eventually but in the meantime I'll try and dig something up with a timer off the tap. I was thinking drip tape but still not sure.